Years ago I recall being told that astringency was one of the basic tastes, along with bitter, sour, sweet and salty. Since then, its place on that list has been taken by umami. Astringency has since been considered a tactile sensation, with similar physiological mechanisms as pain, heat, cold, and pressure. Despite this reclassification and the scientific progress in elucidating some of these mechanisms, there are still many questions that need to be answered. The general phenomenon is defined by the Merriam-Webster dictionary as “tending to pucker the tissues of the mouth”. This isn’t an ideal description of the term as it applies to the food and beverage sensory industry since we know that polyphenol-based astringency sensation does not involve any physical changes in the tissues of the mouth like the traditional astringent alum would produce. A somewhat more applicable use of the term for our purposes is “a compound which precipitates proteins and has a molecular weight over 500”. However, even this definition has limitations, as there are some curious results which defy explanation at the moment. Astringency, as it’s understood in sensory science, is generally described as a rough, dry sensation across the oral cavity. This sensation is caused by an interaction between various polyphenols (from the hops and malt) and certain proteins found in your saliva . When these large and complex molecules interact, they assemble themselves into networks which are too large to stay in solution, and the lubricating properties of the salivary proteins are rendered inactive. This leads to the dry and rough mouthfeel which is detected by the trigeminal nerve (responsible for the tactile sensations of the face). In order to understand how these associations occur, lets look at the structure of the participants. Polyphenols are can be fairly large molecules consisting of a number of aromatic rings (in the electron resonance sense) with a number of phenolic groups scattered about (hence “poly-phenol”). Flavan-3-ols are a type of polyphenol which are common in hops and malt. Examples of them are shown here. You can clearly see the predominance of 6-membered ring structures, some of which are aromatic (alternating double bonds). The phenolic groups (-OH) are numerous. The aromatic rings are prone to associate hydrophobically with other structures which like to do the same, which brings us to our next player. Proline is an amino acid which plays an interestingly varied role in brewing: in astringency as part of salivary proteins, and in trub and chill haze formation as part of barley hordeins. Proline’s uniqueness comes in its side chain: it’s the only side chain with a 5-membered ring that connects back to the beta carbon on the protein backbone, giving it unique abilities in determining the structure of proteins. While this ring structure is not as hydrophobic as the aromatic rings of polyphenols, it is still electron-rich enough to engage in some hydrophobic interactions. As these rings begin to associate they stick a little bit to each other, through a combination of hydrogen bonding and hydrophobic interactions. 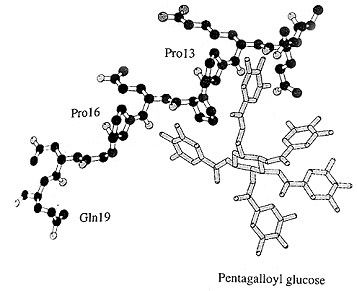 The unique characteristics of polyphenols also allow them to efficiently bridge gaps between the denatured and open proteins strands, particularly once they start to oxidize, which allows polyphenols to further bond randomly amongst themselves into even larger bridging structures. An example of how polyphenols and proline-rich proteins (PRPs) interact is shown here. While the the particular polyphenol in the image is not found in beer, it is still representative of how the rings associate. This mechanism is very influential in brewing with far-reaching influences from the malt-house to your pint glass, and beyond. For that reason, I find it fascinating. This entry was posted in Mouthfeel and tagged astringency, mouthfeel, polyphenols, protein. Bookmark the permalink.